Whether your event is big or small, we’ll be more than happy to cater for you. We’ll prepare the dishes of your choice at our restaurant and not only deliver them to your event, but display our fine cuisine for your guests to see. If you’re having a birthday party, engagement party, anniversary celebration or you just want provide a fantastic meal for your friends, our event catering is perfect. 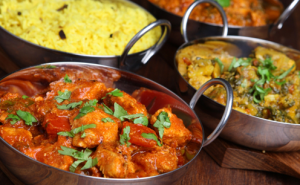 Just call us on 01252 313 638 or email us at info@spiceofindiaash.co.uk and find out more about our affordable pricing options.